Microsoft Office 2016 Quick Start Guide and now for Macs. The new version of Office Suite focuses on improved collaboration and security, taking your content building applications to a whole new level. There are a ton of new features that come with the recent release, a full list can be found here. 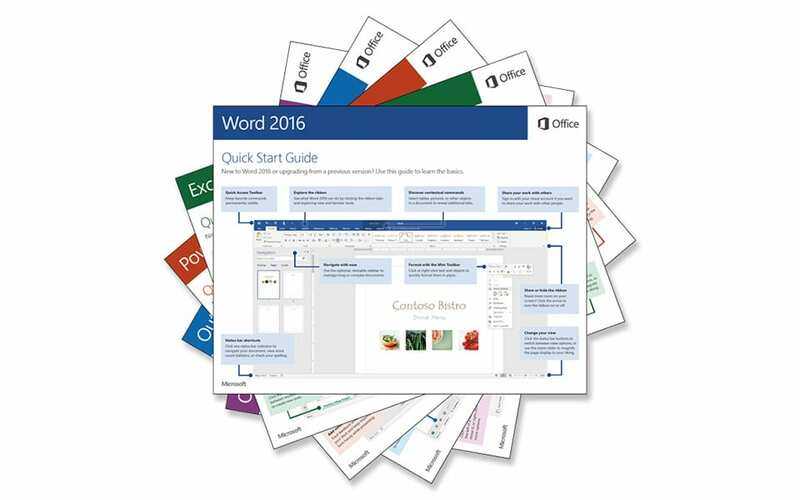 Below you’ll find links to download the Office 2016 Quick Start Guides of your choice, which will introduce you to the newest version of Word, Excel, PowerPoint, Outlook and OneNote. This is a great way to find familiar basics whether you’re coming from a previous version or you’re entirely new to the Office Suite. Office 2016 for Windows: Quick Start Guide for the desktop versions of Word 2016, Excel 2016, PowerPoint 2016, Outlook 2016 and OneNote 2016 – downloadable on any recent version of Windows. Office Mobile for Windows 10: Quick Start Guide for the modern versions of Word Mobile, Excel Mobile, PowerPoint Mobile, or OneNote on Windows 10. Office 2016 for Mac: Quick Start Guide for the Mac versions of Word 2016, Excel 2016, PowerPoint 2016, Outlook 2016 or OneNote 2016 on Mac OS X Yosemite or El Capitan. If you are wondering how to upgrade to Office 2016, we recommend talking with your IT Administrator or contacting the ITS Network Support team first. We’re happy to answer any questions and walk you through the process. Contact your VCIO or call us at 1.866.Pick.ITS. On September 22nd Microsoft released Office 2016 – the latest addition to O365, Windows 10 and now for Macs. The new version of Office Suite focuses on improved collaboration and security, taking your content building applications to a whole new level. There are a ton of new features that come with the recent release, a full list can be found here.